Traditionally, if you needed extra screen real estate – whether for work or play – you’d have to research the best monitors and buy an extra display or two. These days, ultrawide monitors are increasingly commonplace. And while the move to bigger screens has been partly driven by gamers, creative pros have much to benefit from the wealth of tech these huge screens offer. So what’s the best ultrawide monitor, and how do you pick the right one? Well, size is a consideration, of course – most of the ultrawide monitors in this roundup are 34 inches. Make sure you have enough desk space before investing in your chosen model. You also need to think about connectivity (most of these screens feature both HDMI and DisplayPort) and what PC or Mac you’ll be using to drive the display. You’ll want either dedicated Nvidia or AMD graphics, or you’ll need to have Intel-based graphics from the last few years – we’d suggest HD Graphics 3000 or later, or Intel Iris Pro. And you’ll need to make sure you have the latest drivers installed. In terms of resolution, look for WQHD (Wide Quad High Definition) – which gives you a pixel count of 2,560 x 1,440 – and a wide aspect ratio of 21:9. Meanwhile, another handy feature to check for is whether the display can also do picture in-picture or side-by-side, so you can connect up a couple of sources (like two computers, or a computer and tablet) to the same display. Finally, flat or curved? 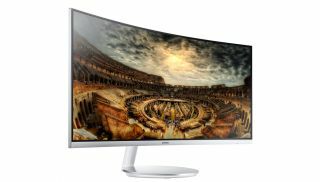 We believe a flat screen is still better for design work, but increasingly the market for large widescreen monitors has moved towards curved displays. Certainly on a flat 34-inch display the sides can feel a little distant. A curved screen will also slightly reduce the amount of side-to-side movement you have to do with your head. If you opt for one, remember to ensure you set up the monitor at an appropriate distance and height from your sitting position. They’re the main considerations you’ll need to make. Now read on for our pick of the best ultrawide monitors you can buy right now. Our top choice for the best ultrawide monitor overall, the Dell Ultrasharp U3415W monitor has wide appeal. It delivers impressive image quality with rich, near-perfect colours, high contrast, WQHD resolution (3,440 x 1,440) and a cinematic aspect ratio of 21:9. Dell’s design ethos has changed dramatically over the years, and the world’s third-largest PC manufacture now makes some pretty desirable gear. Alongside its excellent XPS devices, the firm has carved a great reputation for its displays, thanks to their winning combination of excellent panels and competitive pricing – and for us, the U3415W takes the crown. Sure, this isn’t the best-looking widescreen monitor you’ll find on the market, but it’s still elegant, and makes for a fantastic display for the money. There’s picture-in-picture and dual input support, while USB upstream 3.0 ports in the display mean you can use a keyboard and mouse or other peripherals with more than one computer or other device. Throw in its premium build quality and fantastic out-of-box accuracy, and the Dell Ultrasharp U3415W is easily out top choice for best ultra-wide monitor for creative pros. 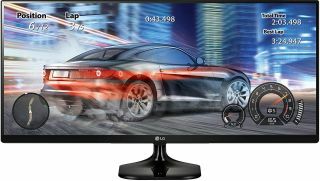 Designed for gaming, the LG 34UC79G is a well-priced ultrawide monitor with DisplayPort plus dual HDMI. There is a potential downside: at 2560×1080, it doesn’t have as high a resolution as more expensive options – LG instead opted for native 144Hz performance. However, we’d choose colour accuracy, contrast and motion blur reduction over a high pixel count – and in most of those areas the LG 34UC79G delivers. It has a great contrast ratio and black levels, alongside vibrant colours, but it does require some calibration for maximum accuracy. The monitor also features a couple of technologies designed to improve gaming performance, including AMD FreeSync (50-144Hz range) to reduce stuttering and motion blur. There’s a fast 1ms response time, too. A cheaper 29-inch version is also available. Still the best curved ultrawide monitor you can get. Curved screens aren’t for everybody, but the Samsung CF791 ultrawide monitor has a sleek design with minimal bezels on three sides and the curve isn’t so exaggerated that you’ll feel cocooned. It will, however, mean a much more immersive experience and if that’s what you’re after for your design work, then look no further – this is also probably the best ultrawide monitor for video editing you can get too. Thanks to its Quantum Dot screen tech, after some calibration the Samsung CF791 delivers rich, sharp and very accurate colours, alongside a stellar contrast ratio. This screen also has some technologies – such as a fast refresh rate and AMD’s FreeSync – that will appeal to gamers. It doesn’t, however, have a response time that’s as good as the LG above (4ms instead of 1ms). Picture-in-picture is supported, or you can view two inputs side-by-side. Need even more screen real estate? 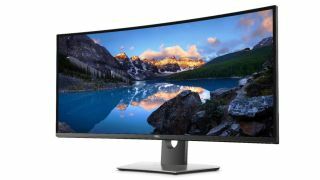 The Dell U3818DW is a huge, curved, 37.5-inch display – and at not far off a metre, it’s the biggest ultrawide monitor we’ve got for you in this buying guide. As you would expect, it costs more than the 34-inch options here, but Dell’s not just upped the physical size of the screen – there’s a bump in resolution, too, with 3,840 x 1,600 WQHD+. Picture-in-picture and dual input is supported, while there’s DisplayPort and dual HDMI inputs. USB-C is also supported, too, for easier connectivity to new Macs, while there are also two upstream and four downstream ports for connecting peripherals to more than one PC or Mac. If you need an even larger screen, this is one of the best ultrawide monitors you can consider. 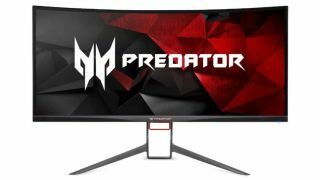 Although the Acer Predator X34P is aimed at gamers, this 34-incher will have wide appeal because it has a more striking design than many of the others out there. Again the screen is gently curved, with accurate colours and good contrast after calibration, and there’s HDMI and DisplayPort support. Boasting Nvidia G-Sync and a 120Hz refresh rate, there are few audiences that the Predator won’t satisfy, although, of course, gaming is its primary use. The disadvantage is that it isn’t cheap, which makes it hard to justify over several of the other, better priced options here. Featuring Nvidia G-Sync for stutter-free gaming, The AOC Agon AG352UCG is our gaming choice if you’re not prepared to put up with the lower resolution of the LG above (and you can stump up the extra cash for this model). Again this display is gently curved and there are also a couple of AOC technologies to improve gaming colours and shadows. The stand is height-adjustable, too. The rear of he screen features a striking ‘winged’ design so won’t be for everybody. It’s a little bit of an odd combination since the front of the display is rather utilitarian in appearance. Is ultrawide really what you want? There are a few options at the lower end of the scale, though it’s harder to find screens that we’d recommend. This LG 25UM58 model is a lot smaller than other other options, at 25-inches, and features a lower resolution than many. 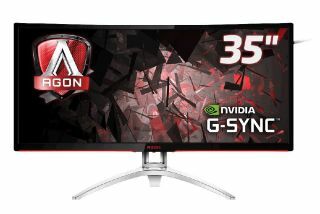 But if an ultrawide monitor is what you want, you might be pulled in by the low price point because this display has been available for a couple of years now. A 29-inch version is also available from some sellers, although we think you’d be better off upgrading to one of the 34-inch models here, if you’re considering that size.